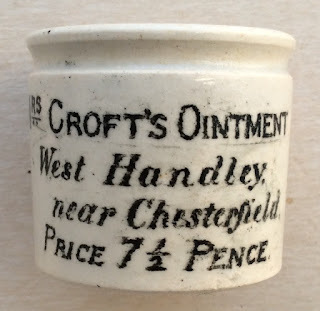 Little is known about the pots produced from the small rural area of West Handley. 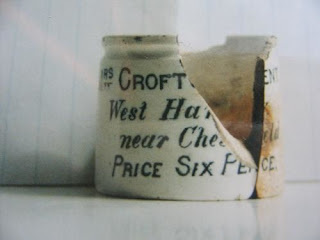 Research to date has not able to confirm the origin of these pots as the "Croft's" found were farmers and there seems to be little connection to the production of an ointment in that area. 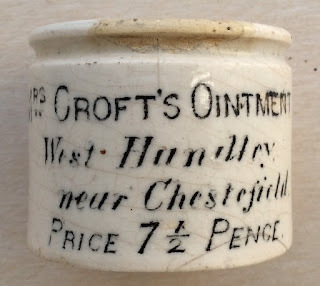 The pots however appear by the style to be produced around 1870. 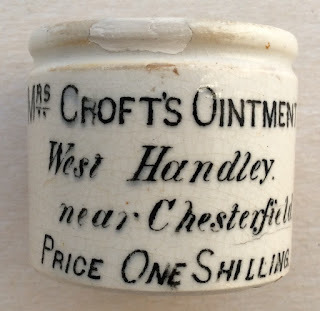 The earlier produced Mrs Crofts pots show the old style spelling of 'Chesterfield' omitting the letter "r". There are three price variations known, the SIX PENCE, the 7 1/2 PENCE and the ONE SHILLING. The 7 1/2 PENCE variation can be found but the other two prices are extremely rare. 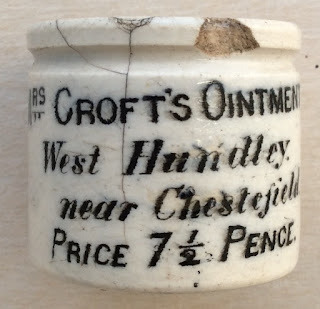 In fact I believe only a broken example of the Sixpence pot is known to exist (pictured below). 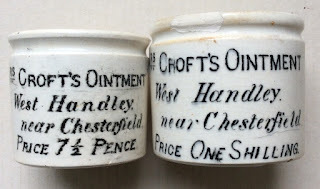 A small article appears in BBR magazine no.74 regarding these ointment pots. I would be very interested to add the SIX PENCE price variation to my collection. If anyone has one and they would be willing to part company with it, please Contact Me. book produced by Messrs. Houghton & Priestley, Pages 64.